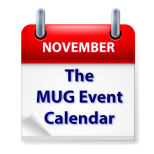 The first MUG Event Calendar of November kicks off with more high-powered guest speakers that we’ve seen for some time. Joe Kissell will speak to a California group, while Apple delivers a triple-threat: Greg Willmore in Ohio, Aaron Davis in Virginia and Steve Zalot in Pennsylvania. Trevor Rooney of Sonos will talk about their products to an Australian group. Other topics on the roster for the week include Scrivner, Parallels, secure communications, iPhone, iOS 8 making Mac music and more. Want to see your meeting details on The MUG Event Center? Put a note on your calendar for the first of the month and email the details of your next meeting to The MUG Center. Simple! appleJAC – "Yosemite Mac OS X 10.10 + 20 Gadgets in 40 Minutes"